Mission Saint-Irénée de Lyon (St. Irenaeus of Lyons) is a Catholic community in the diocese of Montreal utterly unique, whose proper mission is to bear witness of the beauty and spiritual fruitfulness of the Extraordinary Form of the Roman Rite (i.e. Tridentine Mass). It was canonically erected by Archbishop Christian Lepine of Montreal in 2014. 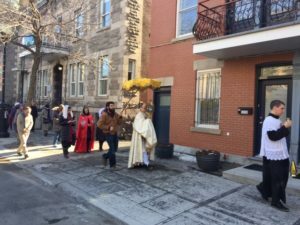 The procession of the Blessed Sacrament at the close of the Forty-Hours devotion February 28, 2017.